Debt Free Companies are one of the best choices for the investment. Debt Free companies are companies with zero debt. Zero debt indicates that company’s financial health is very good. They are capable to withstand any type of economic conditions. The best example of debt free company in India is Hero Motocorp. Hero Motocorp generates enough revenue to finance all internal operations and investment requirements. Hero Motocorp has given very good returns to investors. A low debt company means extra competitive edge, increase in profit margin and high creditworthiness. One should defiantly evaluate debt free company for investment. In this post, I will share top debt free companies. As a list of debt free company is dynamic, I will also share an easy method of finding debt free companies so that, you can also find it as and when required. How to find debt free companies in India? A first step in identifying debt free company is knowing debt to equity ratio of the company. The debt-to-equity ratio means a relation between an amount of capital borrowed and capital contributed by a shareholder. As per thumb rule, a company with lower debt to equity ratio is good for investment. On the other hand higher debt to equity ratio means a company is using more leverage and has a weaker equity position. It is not advisable to invest in the company with higher debt to equity ratio. After understanding debt to equity ratio let’s find out debt free company with zero debt to equity ratio using screener website. A screener is a free stock screener website that helps investors in taking a wise investment decision. Go to the Screener Website. You will be redirected to dashboard. Just scroll down and you will find the query builder. Press Run this query button. The screen will display a list of all the debt-free companies in India. 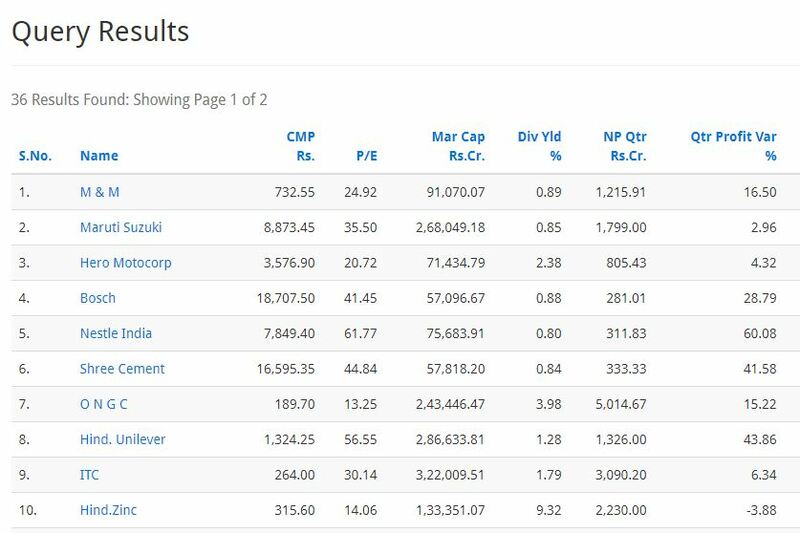 A list of debt free companies with debt to equity ratio less than 0.5 and market capitalization 50000 Cr is given below. You can also customize this query by adding other factors. If you want to find a company with zero debt to equity ratio and market capitalization > 50,000 Cr you can write following query in query builder. You can also save this screen. It is also possible to use this query builder to filter out companies with other financial ratios like PE, ROE, PEG etc. I hope above method of using a query of screener website will help you in finding good companies for investment.